C.R. Mooney » Blog Archive » Lifestyle Abundantly? I was surfing the “God channels” on my TV a few weeks ago and after skipping through a couple of the regular faces, I ran into an individual I generally enjoy, and though I only caught a snippet of what was said, John 10:10 was mentioned, followed by some pretty heavy prosperity doctrine. The last version was the one used. Honestly, I’m glad they have succeeded in making some money, and I would say they are definitely gifted fund raisers, but do they honestly believe that is what God wants for his people? 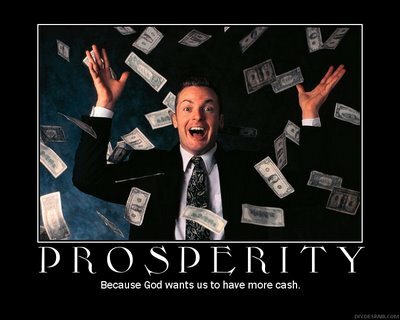 Is it wrong for followers of Christ to have wealth? By no means do I believe that. I just think that these preachers (as well as parishioners) need to be more prudent in explaining that in the Bible, God’s blessing is not equal to an overflowing checkbook. 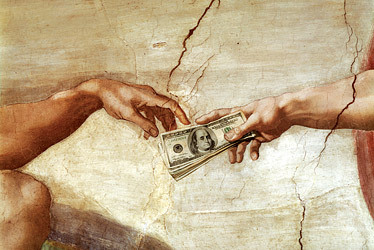 Looking in the Old Testament, you can clearly see that one sign of God’s blessing is wealth. The short list contains Abraham, Job, David, and Solomon, who all had wealth that few today have achieved. But it is just as clear that wealth does not always follow a faithful servant of God. I think this list is just as long, including most of the prophets and disciples. Clearly individuals like Elijah, John the Baptist, Peter, and John the Beloved were following the ways of God, yet their life in no way reflects this monetary blessing. I still believe however that they did have the “abundant life” that Jesus says will follow his disciples. With titles like 8 Steps to Create the Life You Want, Your Best Life Now, Total Life Prosperity, Miracle of Seed Faith, and Rich Church Poor Church it’s pretty clear the message that is being sent. Why they are pushing this agenda for personal gain, or out of a misinterpretation of what Jesus says of abundant life, I am not sure of their motivation. God alone knows their heart. But it is clear that they need to bring some balance to the message. The blessed abundant life that Jesus speaks of is one of relationship, joy, suffering, obedience, and service. See Matthew 10, Mark 10, and John 15 to start with. 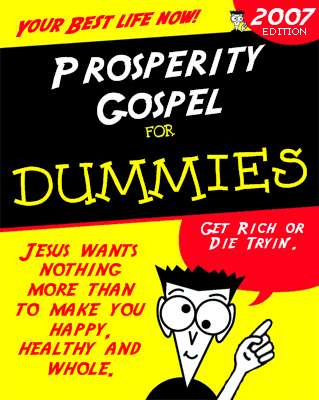 I don’t believe it is wrong for Christians to have wealth, but don’t let it be your ambition. Seek God first, and He will provide your needs. And unless it wasn’t already obvious to you, sending some minister on TV your first paycheck of the month, sowing a seed of $500, and becoming a “Gold Member” of someone’s ministry will not guarantee you any sort of return or Godly influx of cash. Listening to the Father and obeying Him will however keep you in His blessing, and I am sure that whatever He decides your blessing will be is worth it. Lastly, Abraham first left all, Job first lost all, David first suffered all, and Solomon, well you can read Ecclesiastes to know his thoughts on wealth. The cross has always been the center of the Christian faith. The death, burial, and resurrection of Christ are the foundation. Jesus himself “was rich, but for our sake became poor”. Wealth is spiritually neutral, but Paul warned against the love of money, saying that is the root of all kinds of evil. If God deigns to bless us with financial abundance, the call to handle it responsibly is one of the clearest mandates in scripture. The practice of giving to the poor, widows and orphans is one of the most easily identified and constant themes in both the old and new testaments. Good food for thought, Chris.